These desert travel tips will help you travel safely through the high desert of eastern Oregon. Carry a sun umbrella. There can be little to no shade in many sections of the Oregon Desert Trail, so consider taking your shade along with you. Carry tall gaiters. Useful in cross-country sections with heavy vegetation, or in a few spots on the trail with difficult bushwhacks, tall gaiters can also provide a peace of mind when traveling through tall grasses that may be hiding rattlesnakes. Use a hiking pole or stick. Rustle tall grasses as you hike to help alert any snakes or wildlife to your presence and give both of you a chance to move away from an encounter. Hiking poles are also useful when climbing or descending steep terrain, and some ultralight backpacking shelters can be set up with a hiking pole too, negating the need to carry tent poles. Carry plenty of water. Eastern Oregon is very arid, and you may need more water than you are used to in other environments. Be conservative and carry more than you need until you have a good handle on your body’s needs in this environment. Consume plenty of electrolytes. Your body needs salts and sugars to help you absorb the water you are drinking. Drink mixes can be a good form of electrolytes, and can also help mask the flavor of the dirtier water sources in the desert. Carry an adequate water purification system. Water filters are recommended on the ODT, as well as a way to clean that filter. Some water sources can be muddy, and you will most likely need to clean your filter while hiking in the desert. Consider using a bandanna or your shirt as a pre-filter to get any chunks out of your water before filtering to avoid clogging. Chemical or UV water treatments can be useful as well; sometimes hikers may want to treat particularly muddy/dirty water multiple in ways. Hike early or late. Avoiding the heat of the day can help you make your miles; consider getting up early and hiking late. Mid-day can be a good time for a nice long siesta, and a full moon can give you plenty of hiking time at night, especially during those road walk sections. Hike in the spring or fall. The shoulder seasons in the high desert can provide more comfortable temperatures for hiking. Use Verizon cell service. Verizon has the best cell service throughout the high desert. The exception is in the Owyhee region where there is little to no service at all. Consider a personal locater beacon. Technology has advanced to the point that hikers can always seek assistance if needed with the use of personal locater beacons, such as the Spot, and the inReach Explorer. 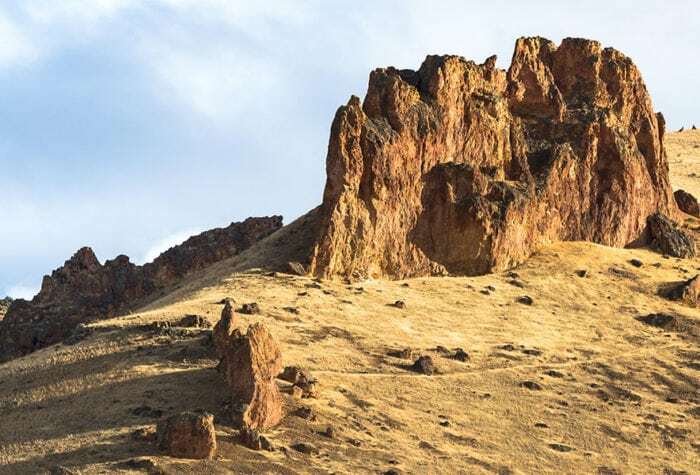 The benefit to a device like the inReach is the ability to communicate via satellite text messages even while in hard-to-reach places like the Owyhee canyon. Avoid walking on Cryptobiotic soil crusts. Several places along the ODT have Cryptobiotic soil crusts, like in the Lost Forest, and these soil types perform important ecological roles including carbon fixation, nitrogen fixation, soil stabilization, alter soil albedo and water relations, and affect germination and nutrient levels in vascular plants. Visually they look like black, knobby crusts on the soil or sand. Don’t follow footprints. The ODT has many miles of cross-country travel, and it’s best to think of these sections as a suggestion of travel. Because we want to minimize impacts of travel in these landscapes, if you see other footprints, don’t follow them. Instead choose a similar bearing and walk a short distance away. Desert soils can be easily impacted, and it only takes a few hikers to start establishing tread in the desert. Use this opportunity to explore: climb a mountain or hike through a nearby valley…make the route unique to your trip, but make sure to stay on public land. Private land is marked clearly on the maps. Cross fences with caution. Hikers will encounter fences on their hike of the ODT, and yes, fences are on public lands. Because many of the high desert landscapes are used for grazing and ranching, these fences keep the cattle where they belong. Cross these fences with care. If you encounter gates, leave them as you find them. Please respect the multiple other uses throughout in the desert. Cover up. Desert sun can be harsh on a hiker’s skin, so consider covering up with lightweight long sleeves and pants for sun protection. Prepare for hot days and cool nights. Even on the hottest days in the desert, the temperatures can drop dramatically when the sun sets. Avoid driving on wet roads. Waterlogged desert soils can bog down a vehicle in inches or feet of mud. If you are traveling to a remote part of the Oregon Desert Trail, recent precipitation could make some roads impassable, even on flat terrain. Gravel roads can be a better bet when conditions are wet as the gravel can provide extra traction between your car tires and the slick mud. Help in the form of a tow-truck can be hours to days away, and prohibitively expensive in these remote locations. Pace yourself. Many factors could impact your daily mileage on the Oregon Desert Trail, so it is a good idea to be conservative in your abilities at first. The route is unmarked, and contains over 30% cross-country travel; these factors can significantly impact your usual pace. Share your hiking plans. Hiking solo or with a small group can be safe and enjoyable if you are prepared, and part of that includes sharing your travel/hiking plans with someone and checking in from time to time. ODT trail registers are also available in certain places along the route (primarily in trail town businesses; see the Town & Services Guide for more info on their location). The point of the Ten Essentials list (developed by The Mountaineers) has always been to help answer two basic questions: First, can you respond positively to an accident or emergency? Second, can you safely spend a night—or more—out? The list has evolved over time from a list of individual items to a list of functional systems. Deposit solid human waste in cat holes dug 6 to 8 inches deep, at least 200 feet from water, camp and trails. Cover and disguise the cat hole when finished.